Does your cat like to drink from the tap? Many cat owners notice that their cats are fascinated by running water. Cats are drawn to running water most likely because in the wild running water would indicate fresh water to a cat. Cats in the wild generally avoid still water or standing water because it can have bacteria in it. That’s why providing a water fountain for your cat is important for your cat’s health. Many domestic cats don’t drink enough water because they don’t like drinking still water from a bowl! Why Use a Water Fountain for Your Cat? A water fountain with a filter constantly recycles the water that your cat can drink which keeps it cool all the time. It also aerates the water so that it tastes better to your cat. The best way to encourage your cat to drink more water is to provide a water fountain filled with bottled water. The fresh-tasting cool water will be very enticing to your cat! If your cat has problems with acne it’s best to use a ceramic or stainless steel fountain. Ceramic and stainless steel fountains are more sanitary for cats. They inhibit the growth of bacteria. Plastic fountains, just like plastic cat dishes, can cause bad chin acne in cats. Make sure that your fountain is cleaned regularly with hot water and soap. And change the filter regularly too. Water fountains for cats come in a range of prices and sizes. A smaller fountain is fine if you have one cat. But if you have two or more cats you should get a larger fountain. Or you could get several small fountains and place them around the house. Sometimes, cats don’t like their water source to be right next to their food. Indeed, it seems that in the wild cats don’t drink water anywhere near their food in case their kill contaminates the water. So if you have noticed that your cat doesn’t like to drink water from a bowl next to its dry food try moving the water to another room. Most cat owners don’t buy water fountains because they think a fountain is too expensive. There are some expensive fountains on the market but there are also some good budget friendly fountains too. 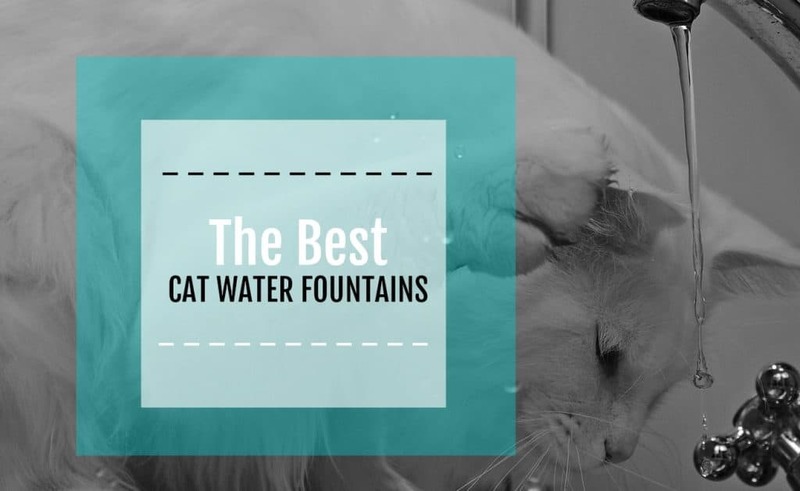 Here’s a quick look at some of the best cat water fountains you can buy in a range of prices. This is a fantastic lower priced cat water fountain. It’s on the small side, so it’s really best for one or two cat households. But it’s made from stainless steel so that it won’t hold onto bacteria. And the design makes it easy for cats to drink. The filter is easy to replace and the replacement filters aren’t expensive. The center part where the water flows is movable so that you can change the position if your cat doesn’t like it. There’s not a lot of splashing. If you want to give your cats a nice fountain without spending a lot of money this is a great option! This fountain is also not super expensive but it has the large capacity that a multiple cat household needs. 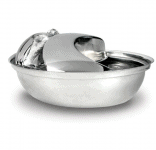 It holds a considerable amount of water and keeps that water very cool and fresh. One of our friends used this fountain for her seven cats for the last five years and it’s still working fine. It is plastic, so it requires frequent cleaning. It is dishwasher safe so she told us to just pop it in the dishwasher once a week to keep it clean and sanitary. The cats really enjoy the flowing water and being able to access water from both the top and the bottom tiers. For the price, you can’t beat the quality of this fountain. Just recently our friend Sonya bought this fountain to give her cats another water fountain to drink from. The price is very reasonable. It holds a lot of water, is very easy to assemble with just two parts and is also very easy to clean. Because it’s plastic it does require cleaning more often than a ceramic or stainless steel fountain. But the design is very inviting to cats and several cats can drink at once. One of the best features of this fountain is that it comes with different rings you can use to adjust the water flow. You can change the flow so that it has only one water stream or multiple water streams. The multiple streams allow more than one cat to drink at a time. And the simple circular design means there is no crowding at the water fountain. You can also control the speed and size of the water streams. 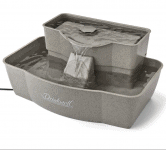 If you prefer a fancier fountain for your cats this is a great choice. It’s ceramic so it inhibits the growth of bacteria. It also comes in fun colors. It is smaller than some of the other fountains so if you have multiple cats you might need multiple fountains. 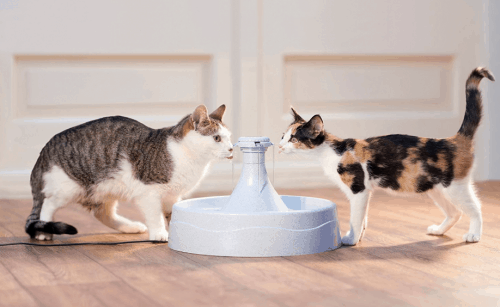 The design is similar to the design of the Drinkwell 360 so it allows for more than one cat to drink at a time. 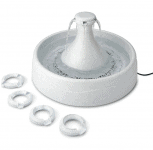 Every cat owner will have to decide for themselves what the best cat water fountain for their home and their cats is. But we think the best one is the Drinkwell 360 or the Drinkwell Ceramic Avalon. 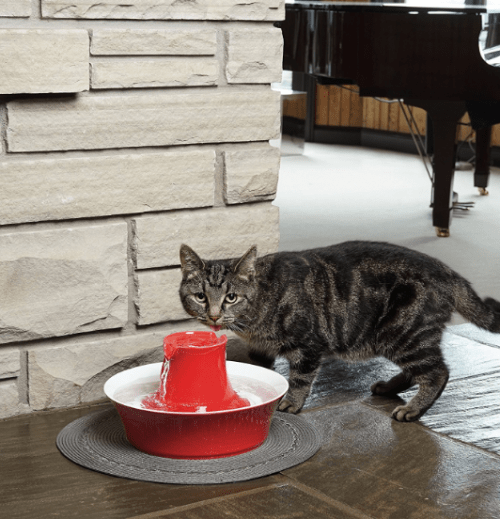 We have been greatly influenced by our friend Sonya; after having cat water fountains in her home for her own herd of cats for many years the clear winner for her was also the Drinkwell 360, but we prefer the style and durability of the ceramic model. One of the reasons we prefer this fountain is because we can create multiple water streams so that multiple cats can drink at a time. Cats in general also seem to prefer this design to any other. We also like that it’s easy to clean and easy to fill. 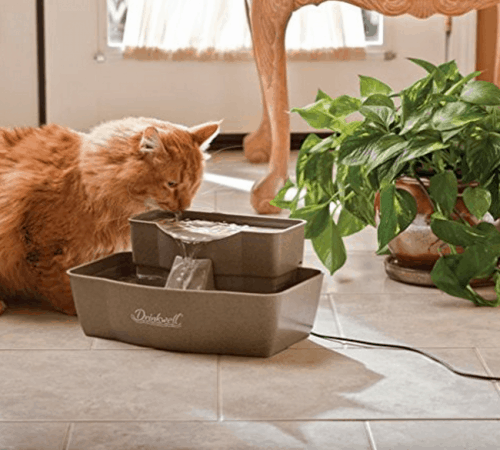 So if you have a multiple cat household and you’re looking for the best cat water fountain that all your cats will use and enjoy, the Drinkwell 360 is definitely one that you should try! For a unique twist on cat water fountains, check out my AquaPurr eC. It is a zero maintenance fountain. No refilling, no cleaning. Just fresh, cool water anytime your cat wants it. Hey Steven, that looks great! 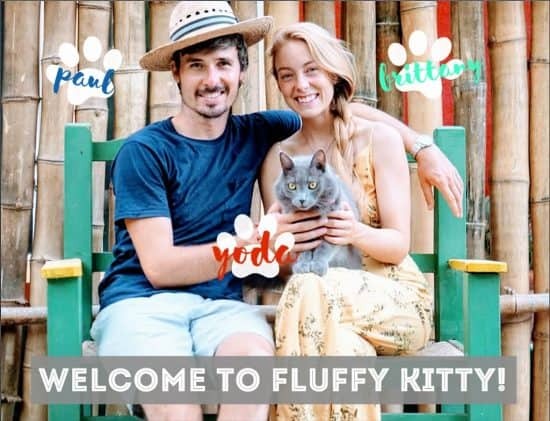 You can send us an email at contactfluffykitty@gmail if you’d like to discuss business opportunities. Thanks for dropping by!